Timepiece technology reflected in design of Stephen Silver's flagship watch boutique. WHEN INTERNATIONAL GEM DEALER Stephen Silver first dipped a toe into the retail world, he found himself in a coat closet. A good friend of his, a benefactor of Stanford University, had told Silver about a plan to develop the Rosewood Sand Hill Hotel, a 5-star resort on university land in Menlo Park, CA, and invited him to open a retail space within. His friend pushed him to reconsider, and he did, but due to a communication mix-up, his boutique wound up in a spot meant to be the restaurant coat closet, a space that, with luck, can hold three people. But somehow, the stars were aligned in a manner that made that 90-square foot store an extraordinary retail success. Still, as the business evolved, research revealed that Stephen Silver was missing out on sales to 80 percent of the hotel visitor foot traffic. Stephen’s son, Jared, impressed upon him that high-end watches were a business opportunity worth looking into. Once Silver learned about watch complications, he found the mechanical technology to be fascinating and appropriate for Silicon Valley’s tech-centric demographic. It was also another avenue to continue sharing the passion for rarity, quality and craftsmanship. The concept for the Flagship Watch Boutique was born. Once watches were identified as the missing link, the retail business expanded into an open-air atrium that had been carved into the middle of the hotel. “We have pictures of a crane lifting a bulldozer to remove all that dirt that we had to pull out before we could begin building,” Silver says. Architect Joel Miroglio transformed the space into an undulating arc of elegant showcases, custom designed in round or oval shapes to simulate the outline of a watch dial. Silver had asked Miroglio to come up with a technical approach to the design of the cases that would complement the watch complications as well as the silhouettes of the watches. They are also very expensive at $50,000 a pop. But they are just what he asked for: The double showcases aligning the windows hang like suspension bridges from steel rods, showing the details of the mechanism in the same way a mechanical movement of a watch is seen through the case back. In the process of creating the 1,300-square-foot watch and jewelry boutique, Silver and his advisers changed their minds about what type of watches to carry. This strategy, he believed, would complement Stephen Silver’s rare jewelry offerings while setting themselves apart from the watch competition. The boutique is the country’s largest dealer of Gruebel Forsey watches, for example, with an average price point of $675,000. The company makes only 82 watches each year and takes at least a year to make each one. The retailer also offers watches from independently owned companies that are more affordable, yet still make a quality statement. “You can make a super high-end product without breaking the bank,” he says. The exclusive timepiece collections are displayed alongside one-of-a kind jewelry treasures. The estate collection comprises handpicked pieces from prestigious jewelry houses, spanning many styles and eras. Custom designs are crafted in platinum and 18K gold, diamonds and colored gems. 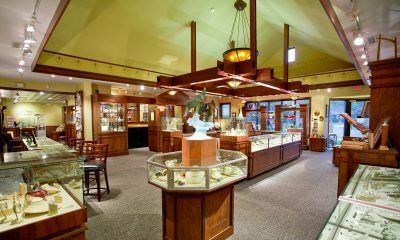 The former coat closet down the hall continues to feature Stephen Silver gem collections, and also serves as a pop-up shop for companies like Chopard and Hermes, who are interested in tapping into Silicon Valley’s high net worth residents. Silver realizes that all the expertise and competence required to make and sell high-end watches to retailers cannot be ruined in the last 18 inches of the supply chain, the space between salesperson and customer on the retail floor. 1.The message. Stephen Silver teamed up with Gluttony, a Manhattan-based branding and marketing agency, to fine-tune its message of elegance and luxury, custom design, hand-made craftsmanship, rare, one-of-a-kind gems and top-of-the-line watch brands. The best way to convey that level of luxury, says Abigail Honor of Gluttony, is by using minimalist design in the marketing materials and the store itself, as well as establishing consistency. “Elegance and luxury speak for themselves,” she says. 2.The magazine. The Stephen Silver Magazine chronicles philanthropic events as well as Silver’s globetrotting adventures and rare acquisitions. Published twice a year and now digital as well, it revels in the elegance of travel, automobiles, technology, fine jewelry and timepieces. 3. Sports strategy. During Super Bowl week, Stephen Silver held an in-store drawing for 12 winners that included an official NFL Super Bowl football, a strand of signature freshwater pearls and a bottle of champagne — the perfect his-and-hers gift. This took place just prior to the “Big Game Big Give” event that raised over a million dollars for charity. 4. Bringing in an expert watch industry veteran was an important step. Silver appointed Andrew Block, with 30 years of luxury brand management experience, as president of the company. Both Silver and Block attend store events to foster relationships with clients. 5. Style savvy. For the first anniversary of the Flagship Watch Boutique, the company rented a private villa and chef at the hotel for a Styling Event and Watch Round Table. A celebrity fashion stylist curated a collection of jewelry to wear with the fashions she had flown in from New York. Watch brand reps led discussion of blending modern technology with old world craftsmanship. As the CEO of a custom wholesale jewelry house, did you know what you were getting into with retail? I had a fairly good idea what it would be like because although the company has been on the supply side for so many years, inside the wholesale business is really an estate jewelry business. It’s tough in a different way from wholesale. The client is demanding, not any more or less than my clients inside the trade, just a different type of demanding. If you aren’t paying attention to delivering service with the right attitude, you will not be competitive. There’s a value in the way we present ourselves and the look of the store and our merchandise, but if it’s not reinforced by a great atmosphere by our employees, then it’s a road to disaster. And disaster can hit very quickly in retail. What sets your retail business apart from the competition? Our business is driven by a very, very strong knowledge of the product. Because we make it, we cut it, we have a very different attitude about how we approach our merchandising and our business development. It makes the process of taking risks a little less daunting. Clientele receive it better when they are truly in front of the makers of what they are buying. Do you have plans to expand your retail footprint? I hate to say this, but yes. We have a few locations we’re looking at, but we have such a unique footprint that it’s going to be hard to recreate what we’ve established here. To line up the stars the way we’ve lined them up here is nearly impossible. Who is your watch customer? Our buyers tend to be younger than the average watch consumer because of the nature of the technology business. There are many companies here that were developed by young entrepreneurs, some of which become successful. After they’ve bought their homes, planes and boats and other toys, they start looking at life a little more seriously and looking for an alternative investment strategy. What was your reaction when your friend invited you to open a retail space in the new Rosewood Sand Hotel on the campus of Stanford University? Initially, I rejected the idea. We had a 30-plus year history of supplying retailers all over the world with our product. And I had noticed that the jewelry stores most likely to fail were stores within hotels. And when you did agree to open a small boutique in the space, what were the results? It started generating more dollars per square foot than any other retailer in the U.S. We have a very wealthy crowd that frequents the hotel and restaurant and bar. The community has really embraced the hotel as part of the culture. It’s become a destination store. Looking for GIA-trained gemologists assures that it’s easy to communicate internally and train, because everyone has a common language. I demand that of the company, that the core competency must be there in the back end and the front end. When you decided to add a watch store to your offerings, how did architect Joel Miroglio reflect the merchandise in the design of the space? I wanted a case statement made that was in the spirit of the engineering and mechanics of fine timepieces. The cases are very, very heavy; they are secured on the ceiling by a steel beam and also into the floor by another steel beam. Our buyers tend to be younger than the average watch consumer because of the nature of the technology business. There are many companies here that were developed by young entrepreneurs, some of which become successful. After they’ve bought their homes, planes and boats and other toys, they start looking at life a little more seriously and looking for an alternative investment strategy. As we developed the strategy, our evidence shifted us away from the major brands. We focused on small companies that make from 80 watches to a few thousand a year.